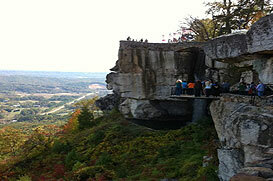 Lookout Mountain, also known as the “Jewel of the South,” is one of the most unique communities the greater Chattanooga area. Located in Walker County Georgia, this community includes every type of housing from very high end developments and brow homes to more modest properties and working farms. Besides being home to some of the areas most important park and conservation land such as Lula Lake Land Trust and Cloudland Canyon State Park, Lookout Mountain also has some of Chattanooga’s most famous tourist attractions like Rock City and Ruby Falls. It is also home to Covenant College. As of the 2000 census, there were about 1,617 people living in Lookout Mountain, Georgia and 618 households. The number of people living in this community of 2.7 square miles included 441 families and a population density of about 608 people per square mile.